The following report was released January 23, 2014 by the Privacy and Civil Liberties Oversight Board. Statements from board members Elisebeth Collins Cook and Rachel Brand were released along with the report. 2) To ensure that liberty concerns are appropriately considered in the development and implementation of laws, regulations, and policies related to efforts to protect the Nation against terrorism. This Report arises out of the Board’s responsibility to provide oversight by analyzing and reviewing executive branch actions, in this case the operation of the Section 215 telephone records program. Section 215 is designed to enable the FBI to acquire records that a business has in its possession, as part of an FBI investigation, when those records are relevant to the investigation. Yet the operation of the NSA’s bulk telephone records program bears almost no resemblance to that description. 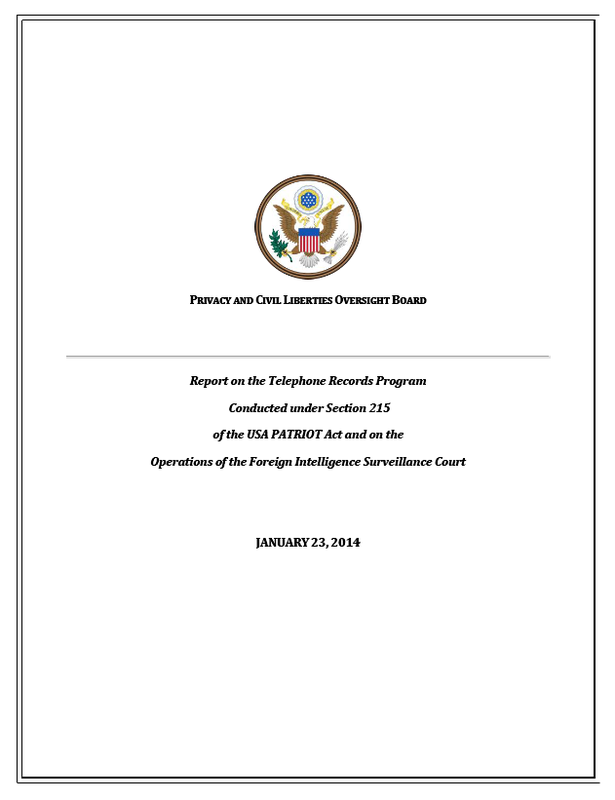 While the Board believes that this program has been conducted in good faith to vigorously pursue the government’s counterterrorism mission and appreciates the government’s efforts to bring the program under the oversight of the FISA court, the Board concludes that Section 215 does not provide an adequate legal basis to support the program. There are four grounds upon which we find that the telephone records program fails to comply with Section 215. First, the telephone records acquired under the program have no connection to any specific FBI investigation at the time of their collection. Second, because the records are collected in bulk — potentially encompassing all telephone calling records across the nation — they cannot be regarded as “relevant” to any FBI investigation as required by the statute without redefining the word relevant in a manner that is circular, unlimited in scope, and out of step with the case law from analogous legal contexts involving the production of records. Third, the program operates by putting telephone companies under an obligation to furnish new calling records on a daily basis as they are generated (instead of turning over records already in their possession) — an approach lacking foundation in the statute and one that is inconsistent with FISA as a whole. Fourth, the statute permits only the FBI to obtain items for use in its investigations; it does not authorize the NSA to collect anything. In addition, we conclude that the program violates the Electronic Communications Privacy Act. That statute prohibits telephone companies from sharing customer records with the government except in response to specific enumerated circumstances, which do not include Section 215 orders. Finally, we do not agree that the program can be considered statutorily authorized because Congress twice delayed the expiration of Section 215 during the operation of the program without amending the statute. The “reenactment doctrine,” under which Congress is presumed to have adopted settled administrative or judicial interpretations of a statute, does not trump the plain meaning of a law, and cannot save an administrative or judicial interpretation that contradicts the statute itself. Moreover, the circumstances presented here differ in pivotal ways from any in which the reenactment doctrine has ever been applied, and applying the doctrine would undermine the public’s ability to know what the law is and hold their elected representatives accountable for their legislative choices. The NSA’s telephone records program also raises concerns under both the First and Fourth Amendments to the United States Constitution. We explore these concerns and explain that while government officials are entitled to rely on existing Supreme Court doctrine in formulating policy, the existing doctrine does not fully answer whether the Section 215 telephone records program is constitutionally sound. In particular, the scope and duration of the program are beyond anything ever before confronted by the courts, and as a result of technological developments, the government possesses capabilities to collect, store, and analyze data not available when existing Supreme Court doctrine was developed. Without seeking to predict the direction of changes in Supreme Court doctrine, the Board urges as a policy matter that the government consider how to preserve underlying constitutional guarantees in the face of modern communications technology and surveillance capabilities. In a representative democracy, the tension between openness and secrecy is inevitable and complex. The challenges are especially acute in the area of intelligence collection, where the powers exercised by the government implicate fundamental rights and our enemies are constantly trying to understand our capabilities in order to avoid detection. In this context, both openness and secrecy are vital to our survival, and we must strive to develop and implement intelligence programs in ways that serve both values. Transparency is one of the foundations of democratic governance. Our constitutional system of government relies upon the participation of an informed electorate. This in turn requires public access to information about the activities of the government. Transparency supports accountability. It is especially important with regard to activities of the government that affect the rights of individuals, where it is closely interlinked with redress for violations of rights. In the intelligence context, although a certain amount of secrecy is necessary, transparency regarding collection authorities and their exercise can increase public confidence in the intelligence process and in the monumental decisions that our leaders make based on intelligence products. In the aftermath of the Snowden disclosures, the government has released a substantial amount of information on the leaked government surveillance programs. Although there remains a deep well of distrust, these official disclosures have helped foster greater public understanding of government surveillance programs. However, to date the official disclosures relate almost exclusively to specific programs that had already been the subject of leaks, and we must be careful in citing these disclosures as object lessons for what additional transparency might be appropriate in the future. The Board believes that the government must take the initiative and formulate long-term solutions that promote greater transparency for government surveillance policies more generally, in order to inform public debate on technology, national security, and civil liberties going beyond the current controversy. In this effort, all three branches have a role. For the executive branch, disclosures about key national security programs that involve the collection, storage and dissemination of personal information — such as the operation of the National Counterterrorism Center — show that it is possible to describe practices and policies publicly, even those that have not been otherwise leaked, without damage to national security or operational effectiveness. With regard to the legislative process, even where classified intelligence operations are involved, the purposes and framework of a program for domestic intelligence collection should be debated in public. During the process of developing legislation, some hearings and briefings may need to be conducted in secret to ensure that policymakers fully understand the intended use of a particular authority. But the government should not base an ongoing program affecting the rights of Americans on an interpretation of a statute that is not apparent from a natural reading of the text. In the case of Section 215, the government should have made it publicly clear in the reauthorization process that it intended for Section 215 to serve as legal authority to collect data in bulk on an ongoing basis. There is also a need for greater transparency regarding operation of the FISA court. Prospectively, we encourage the FISC judges to continue the recent practice of writing opinions with an eye to declassification, separating specific sensitive facts peculiar to the case at hand from broader legal analyses. We also believe that there is significant value in producing declassified versions of earlier opinions, and recommend that the government undertake a classification review of all significant FISC opinions and orders involving novel interpretations of law. We realize that the process of redacting opinions not drafted for public disclosure will be more difficult and will burden individuals with other pressing duties, but we believe that it is appropriate to make the effort where those opinions and orders complete the historical picture of the development of legal doctrine regarding matters within the jurisdiction of the FISA court. In addition, should the government adopt our recommendation for a Special Advocate in the FISC, the nature and extent of that advocate’s role must be transparent to be effective. It is also important to promote transparency through increased reporting to the public on the scope of surveillance programs. We urge the government to work with Internet service providers and other companies to reach agreement on standards allowing reasonable disclosures of aggregate statistics that would be meaningful without revealing sensitive government capabilities or tactics. We recommend that the government should also increase the level of detail in its unclassified reporting to Congress and the public regarding surveillance programs. Recommendation 1: The government should end its Section 215 bulk telephone records program. The Section 215 bulk telephone records program lacks a viable legal foundation under Section 215, implicates constitutional concerns under the First and Fourth Amendments, raises serious threats to privacy and civil liberties as a policy matter, and has shown only limited value. As a result, the Board recommends that the government end the program. Without the current Section 215 program, the government would still be able to seek telephone calling records directly from communications providers through other existing legal authorities. The Board does not recommend that the government impose data retention requirements on providers in order to facilitate any system of seeking records directly from private databases. Once the Section 215 bulk collection program has ended, the government should purge the database of telephone records that have been collected and stored during the program’s operation, subject to limits on purging data that may arise under federal law or as a result of any pending litigation. The Board also recommends against the enactment of legislation that would merely codify the existing program or any other program that collects bulk data on such a massive scale regarding individuals with no suspected ties to terrorism or criminal activity. Moreover, the Board’s constitutional analysis should provide a message of caution, and as a policy matter, given the significant privacy and civil liberties interests at stake, if Congress seeks to provide legal authority for any new program, it should seek the least intrusive alternative and should not legislate to the outer bounds of its authority. The Board recognizes that the government may need a short period of time to explore and institutionalize alternative approaches, and believes it would be appropriate for the government to wind down the 215 program over a brief interim period. If the government does find the need for a short wind-down period, the Board urges that it should follow the procedures under Recommendation 2 below. Recommendation 2: The government should immediately implement additional privacy safeguards in operating the Section 215 bulk collection program. Recommendation 12: The scope of surveillance authorities affecting Americans should be public. In particular, the Administration should develop principles and criteria for the public articulation of the legal authorities under which it conducts surveillance affecting Americans. If the text of the statute itself is not sufficient to inform the public of the scope of asserted government authority, then the key elements of the legal opinion or other documents describing the government’s legal analysis should be made public so there can be a free and open debate regarding the law’s scope. This includes both original enactments such as 215’s revisions and subsequent reauthorizations. While sensitive operational details regarding the conduct of government surveillance programs should remain classified, and while legal interpretations of the application of a statute in a particular case may also be secret so long as the use of that technique in a particular case is secret, the government’s interpretations of statutes that provide the basis for ongoing surveillance programs affecting Americans can and should be made public. As illustrated above, precedent from other legal contexts involving the production of records does not support a concept of relevance like the one proffered by the government in support of the NSA’s bulk calling records program. To be sure, the case law regarding civil discovery, grand jury subpoenas, and administrative subpoenas shows that relevance is interpreted broadly, and that incidental production of unrelated materials is accepted as essential to enable fulsome investigative efforts. Standards of relevance thus permit parties and the government to engage in a degree of fishing, so long as it is not arbitrary or in bad faith. But the case law makes equally clear that the definition of relevance is not boundless. And no case that we have found supports the interpretation of relevance embodied in the NSA’s program. Tacitly acknowledging that case law from analogous contexts is not adequate to support its position, the government suggests that Section 215 calls for “an even more flexible standard” of relevance. But none of the government’s arguments, in our view, supports a definition of “relevant” as broad as the one the government proffers. First, had Congress wished to inscribe a standard of relevance in Section 215 even less exacting than those developed in analogous legal contexts, it could have done so. But contemporary statements from legislators, highlighted by the government itself, evince an intent to match Section 215 to the standards used in those contexts. The reference to grand jury subpoenas added to the statute in 2006 was meant to reassure those with concerns about the scope of Section 215 that the statute was consistent with practice in other fields. Second, the fact that Section 215 requires only “reasonable grounds to believe” that records sought are relevant to an “investigation,” as the government emphasizes, does not call for a different standard of relevance than the one used in all other contexts. By demanding only “reasonable grounds to believe,” rather than certainty, that items sought are relevant to an investigation, the statute ensures that Section 215 is consistent with the analogous civil and criminal contexts — where the requester need not show that every item sought actually is relevant in an evidentiary sense, but merely that the items reasonably may be. The statute’s reference to a reasonable belief about the items requested shows that it contemplates the same scenario faced in the subpoena and discovery arenas: the government seeks a category of items that it reasonably suspects, but cannot be sure, includes material pertinent to its investigation. That scenario, and the legal standards that govern it, still require some factual correlation between the category of documents defined by the government and the circumstances of the investigation for which they are sought. Indeed, Section 215’s requirement of a “statement of facts” supporting the government’s belief underscores the importance of that context-specific inquiry. Thus, even if the qualifier “reasonable grounds to believe” imposes a lower burden of proof on the government than if the statute simply authorized production of “relevant” documents, Section 215 still embodies the assumption that specific facts will link the government’s investigation to the particular group of records it seeks. That assumption is incompatible with a continuously renewed request for the daily acquisition of all records of a particular type. These valid distinctions, in our view, simply mean that the government will be able to make qualitative showings of relevance more often in national security investigations than in others. Because the government is investigating a broader scope of actors, over a longer period of time, across a wider geographic range, and before any specific offense has been committed, more information can be expected to be legitimately relevant to its efforts. Such considerations do not call for the wholesale elimination of relevance as a meaningful check on the government’s acquisition of items. Finally, the heightened importance of counterterrorism investigations, as compared with typical law enforcement matters, does not alter the equation. Items either are relevant to an investigation or they are not — the significance of that investigation is a separate matter. No matter how critical national security investigations are, therefore, some articulable principle must connect the items sought to those investigations, or else the word “relevant” is robbed of meaning. Congress added a relevance requirement to Section 215 in 2006 knowing full well that the statute governs national security investigations. It cannot, therefore, have meant for the importance of such investigations to efface that requirement entirely. In sum, we find the government’s interpretation of the word “relevant” in Section 215 to be unsupported by legal precedent and a subversion of the statute’s manifest intent to place some restriction, albeit a generous and flexible one, on the scope of the items that can be acquired under its auspices.